The sad thing is that some people still have faith in Bitcoins. Rarely seen a currency that's as unstable and vulnerable as this one. I saw this on the Beeb earlier. It seems a bit silly that you can just have that much money show up out of the blue, it makes you wonder if they have managed to forget other stashes of money too. I worked in a bank for a short while and they had a bitchfit if any of the tellers had even one penny missing (or spare) at the end of the day. EVERYTHING was accounted for and heads would roll if the totals didn't add up to what was expected. Yet If I bought myself a sandwich and a packet of condoms with a coin worth $577, I would get some very unflattering looks from the cashier. Eh, the whole Mt Gox thing is roughly equivalent to an uninsured bank going bust. One of the downsides to not having a central authority. On the other side, are they claiming that one of their wallets got hacked and emptied, or was that just rumor? Because all bitcoin transactions are public, so if they made the address of the wallet in question public then it would be possible to simply research where the bitcoin went when it left their hands. As an aside, if anyone wants to play around with bitcoin mining, all you have to do is grab a copy of cudaminer (if you have an nvidia GPU), or cgminer (if you want to buy special mining hardware) and point it at an appropriate mining pool. I use GHash/CEX.io personally (because they don't charge a pool fee for mining with your hardware, and offer an option to buy hosted mining on their pool if you don't want to run your own hardware). If you plan on doing GPU mining, you're better off to do one of the scrypt based altcoins though (because there's not a huge gap in raw power between dedicated mining hardware and using your GPU, just a difference in power efficiency), like litecoin or dogecoin. CEX/GHash has pools for those too, but not hosted mining. If you're willing to wait a long while before you have enough to do anything with them, there are a few bitcoin "faucets" out there (sites that give out tiny amounts of bitcoin). QoinPro is one of the few that doesn't seem to ask for much in return. I assume they plan on selling the email address you signed up with to advertisers or something, but I haven't seen any unusual spam make it through my spam filter since signing up, aside from a single email from them daily noting the deposits to my account (though their minimums to transfer out of the account are high enough that it'll take a whiel to actually *do* anything with it). Most other "faucets" (like DailyBitcoins) run on some combination of selling advertising space and captcha arbitrage (basically there are sites who will pay people to solve captchas, and they play middle man for a cut) -- those sites ask you to solve a captcha (or visit some site) for some tiny amount of bitcoin. Welcome to wholly unregulated banking. They essentially left a pile of money in a safe deposit box and forgot about it, because they weren't keeping their accounting straight, because no one is making them. I wish I found $115 million in a forgotten wallet, all I ever seem to find are quarters in my old coats. The bitcoin equivalent of Captain Flints treasure is the 4.3 million dollars worth on a HDD buried in a landfill in wales. 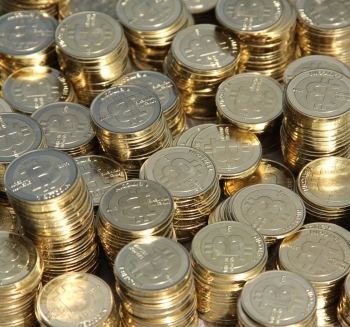 Bitcoins have no intrinsic value of their own, they're like a stand-in for money. The same way a token or a poker chip is. The difference is that in order to get a token to play arcade games, you must first exchange actual money: you put a dollar in the machine and it spits out four tokens. Similarly with poker chips, you give the casino $50 and they give you $50 in poker chips allowing you to bet at the tables. From what I gathered, however, there is no such "initial investment" in bitcoins. You simply sign onto a database that's randomly generating data packets at set intervals and that's how you amass bitcoins. How are they connected to currency - of any kind - if there's no initial investment to begin with? Is that interpretation wrong? If so, how does it work? I then brought up the question "so what's the point?" Why bother amassing these things if they have no essential value? Are there online stores that accept bitcoins for purchases of real-life items, allowing you to essentially buy things for free? If not, then again: what's the point of amassing them? Where's this "115 million dollars" coming from? In the end my question is simply this: bitcoins are clearly some type of resource, what is their actual use? Anyone still invested in this scam deserves what ever they get. Bitcoins are actually given out for being part of a network that processes the calculations necessary to verify bitcoin transactions. As more and more bitcoins are added to the system, fewer bitcoins are awarded and at present the process it too resource intensive to be profitable for the average person. As such most people would obtain bitcoins by buying them for official currency. Bitcoins are meant to be used as a currency to make every day purchases but have not been widely accepted beyond the internet. This of course hinders their usefulness to the average person. Most of the value assigned to Bitcoins is merely speculative which is why the currency is so violatile and unstable right now. Bitcoins are not "free" since there is an electricity cost associated with running the hardware that is used for the calculations that generate bitcoins. Allegedly...we only have the guy's word that the hard drive existed or that it had the money. Putting complete faith in this story is like believing when a fisherman says he almost caught a fish that was THIIIIIIIIIIIIIIIISSSSS big. But this whole thing is funny... I wonder how much more oif those hacked bitcoins will show up later .. you know, when the company is dissolved and wrapped up... heh heh. "Oh look what I just discovered on this thumbdrive I've been carrying around but never using for the past 5 years! Let me blow your mind real quick: Currency has no intrinsic value of it's own, beyond the physical resources it is manufactured from. It only gains value in it's ability to be used as a facilitator of trade. That is to say that anything being used as a currency gains it's value from representing a measure of debt in some abstract sense. All bitcoin transaction are signed using a cryptographic process. The network itself pays newly created bitcoins to whoever manages the initial proof of validity of a transaction. Transactions also have a certain (variable) amount of processing fee to be attached to them that is also awarded to the same individual. The amount the network pays gradually decreases over time, until it reaches the maximum the network will ever generate at which point no more bitcoins will be generated and the only income from processing bitcoins will be the transaction fees themselves. The easiest comparison would be to imagine some poker site making an equivalent to [email protected] for processing their transactions, and giving you some chips every time you do good. Your only necessary investment is the hardware and electricity to perform transactions which, in the case of bitcoin (and other SHA-256 based cryptocurrencies) it is difficult to throw enough processing at it to matter without some specialized hardware. For scrypt based cryptocurrencies (such as Litecoin and Dogecoin), you can do a meaningful amount of processing with your CPU and GPU (scrypt is actually designed to make specialized hardware less advantageous to the point that the first specialized processor recently came out, and it is about 1/3 as good as my nvidia 470 [but burns *much* less electricity]). Most people who mine bitcoins do so in a mining pool, wherein when a block is mined the coins from that block are divided according to some rule or another decided by the pool manager. Basically, it is much faster to narrow the field down than it is to verify one hash completely, so the pools work by excluding anything that certainly isn't it, and letting the pool organizer verify the handful that pass the first check. There are online stores that accept bitcoin, as an example Humble Bundle does. As far as where the "115 million dollars" comes from, that based on what people are currently paying for bitcoin. Right now the price is around $600 per bitcoin. To be entirely honest, and hoping this won't get me in any kind of mod trouble, they let you engage in an economic transaction with someone without necessarily revealing either of your identities to the other. There was a story not long ago about a site called Silk Road getting shut down. Here's a concise description of what Silk Road was -- like eBay, but on TOR and in Bitcoin to maximize everyone's anonymity and with no restrictions of any kind on what you can sell (which means anything you can conceive of that someone might want to sell and is illegal was for sale on that site). It got busted for reasons wholly unrelated to issues with TOR or Bitcoin, so there's probably another such site open by now. Forgive me for skipping the rest of your post...quite simply it's a lot of bells and whistles on this end. But this was the answer that I was looking for: there are indeed stores that accept them. I was just wanting to know what the entire purpose behind them was other than just amassing them because "reasons". I appreciate your response, and I did try to follow the explanation as best as I could...but it's still mostly just mumbo-jumbo to me.